Rivers:- The river fishing to continues to be very good. Late in the evening is the best time. Fishing a Beetle, Hopper or other smal dry is a good option. Evening rises have been the best time to get connected to fish on the dry. Best flies have been Blue Wing Olive parachutes, Klinkhamers, Elk Hair caddis, Geehi Beetles, Red Tags, Ti Tree Beetles, Daves Hoppers, Glen Innes Hoppers, Snowy Hoppers are the best patterns in the streams at the moment. Lake Eucumbene:- The lake has been rising for the last week or so and the lake is looking fantastic at Buckenderra, Seven Gates, and Yens Bay with lush grassy bays. Hopper fishing can be good during the day especially when burleying with live hoppers. This is a great way to find where the fish are so you can then fool them with an artificial. 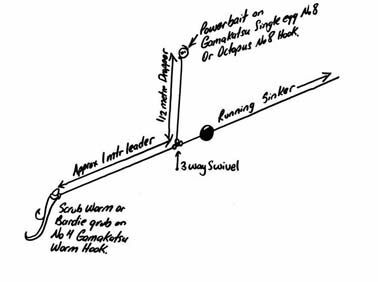 A sinking line fished off the bank or boat with a Woolly Bugger or other streamer pattern is another option during the day. *Mick, Kieran and myself had a quick session last week near Frying Pan in a reasonable electrical storm, and the fishing was not easy. We only managed two Rainbows around the 35 cm mark between us. *Mick returned on Sunday morning with very early 4am start, and reported that fish were moving everywhere. He hooked eight landing only two which is a piss poor effort . A nymph under a Humpy hooked the fish. Trolling has been best down deep with leadcore or a Downrigger. There are good numbers of fish being caught trolling around the edges of grassy bays, in the deeper water around the Western shoreline and also the river mouth area. There has been some problems with grass being blown into the water that is floating and causing problems for trollers as it catches on lines and lures. Searching for bays devoid of this debris will avoid frustration. Rapala GSR 5 Shad Raps have worked well fished off the rod tip. Jindabyne:- If you really want to catch a fish being on the water as the light starts to improve is essential. Fishing deep is still the best option as it is in Eucumbene, Tassies and shallow running minnows are the go in close. Small Rebel Crickhoppers and CD1's have been very good too. Tassies in orange pink and yellows have been great. In Eucumbene try the Seven Gates, Old Adaminaby, Buckenderra, Collingwood and Coppermine.